More Time with Patients Can Lead to Improved Care. 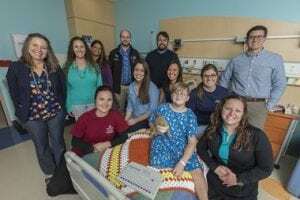 While most of us are still fumbling around in the dark for the snooze button, dedicated residents are arriving at Johns Hopkins All Children’s Hospital at an impressive 6 a.m. to begin getting vital signs and reviewing patient information. Their days are long and hectic, rounding to see patients, combining lunch and lectures, then returning to patient care. Because they rotate to a new area of the hospital every six weeks, residents’ jobs are a constant stream of learning, which can make it challenging to find time to prioritize bedside manner and patient-centered communication skills. That’s why third-year resident Nicole Nghiem, M.D., jumped at an opportunity offered by the Accreditation Council for Graduate Medical Education (ACGME) to create a resident-led initiative called Back to Bedside, designing ways to increase time with patients. Nghiem, pronounced “Nim,” who is specializing in general pediatrics, led a team that offered a winning idea: a program called “All About Us,” which creates protected time each week to be spent with patients. The Johns Hopkins All Children’s residency program received a $10,000 grant from ACGME, renewable for up to two years, all but ensuring success of the program, which kicks off this month. All About Us is an initiative in collaboration with nurses and Child Life specialists. It will use grant money for games, toys and medical team baseball cards (used in place of business cards) that patients can collect from their doctors, nurses and Child Life specialists. They include fun facts on each caregiver, such as favorite foods, hobbies and trivia. In turn, patients are asked to design an “All About Us” poster for their room that offers their own personal facts, all of which can help start a great conversation and get everyone acquainted. The residents are thrilled about the opportunities All About Us will provide to help patients. The long-term goal is to disseminate this to other inpatient teams and eventually across the entire hospital once residents have tried it out. The Office of Medical Education as well as the inpatient hospitalist faculty will be providing resources and mentorship throughout the grant process. After all, there are resident baseball cards to start trading.